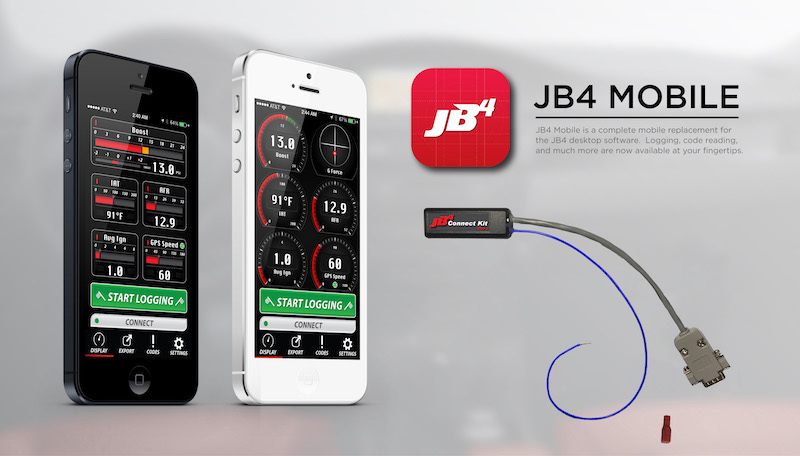 If you need any assistance with JB4 Mobile or the JB4 Connect Kit, email me at support@jb4connectkit.com. I don't check this thread anywhere near as often as I check my emails and it allows us to resolve any issues in a nice organized thread specific to your request. This will now be the thread for all of my JB4 based apps. These include JB4 for OS X, JB4 Mobile for iOS, and JB4 Mobile for Android. Big thanks to MasterWang for all his hard work on the graphics. And another thanks to sirdaft1 and BMW Fanatic for the cool product videos below. All Rev 3 users MUST select Rev 3 from the connection type menu BEFORE attempting to connect. Available from Burger Motorsports here. International shipping: $63.50. I only ship via USPS Priority Express due to the included tracking/insurance. App purchases only valid for the device family they were purchased on. For example, if you buy the iOS app and decide to switch to Android later, you will need to purchase the app on that platform. Android - Can connect with an OTG cable or my JB4 Connect Kit. Note that not all Android devices are either OTG compatible or Bluetooth Low Energy compatible. It is up to you, the user, to find out if your device supports either OTG or Bluetooth Low Energy. Android users using my JB4 Connect Kit must realize that the Android Bluetooth Low Energy implementation is still not up to par with iOS's. Due to this, Android users may need to restart their device to be able to connect to my kit. This is not a problem with my kit, but rather an issue with Android's Bluetooth 4.0 implementation. Hopefully they will pay more attention to Bluetooth 4.0 in the near future. Sometimes the app will say "Connected", but no data appears to be coming through. Simply do a code reading to restart the stream. Each JB4 Connect Kit comes with a 30 day exchange only warranty. The warranty only covers defects in manufacturing and begins when the kit is delivered. 1) Variable number of gauges. 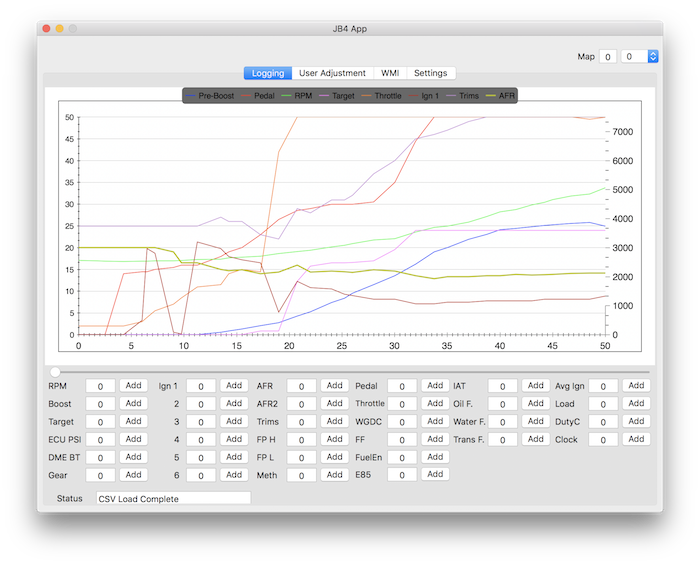 2) Playback logs via gauges. 4) HUD mode (Completed in iOS). 6) Audible alerts when passing set thresholds. 8) Background logging for Android. The JB4 OS X app. Open System Preferences->Security & Privacy->General->Allow Apps downloaded from "Anywhere"
*Stop and display will only appear if the JB4 is currently logging. Has the same functionality as the JB4 Windows application with a few things under development. Please let me know of any bugs/issues you experience. This software is provided AS-IS. Donnie Wittbrodt is not responsible for any damage done to you, your car, or anyone/anything else. These products/apps are not affiliated with Burger Motorsports. Please direct any questions regarding these products to jb4connectkit+support@gmail.com. Last edited by Dmac @ BMS/DMD; 03-28-2019 at 12:10 PM..
Last edited by Dmac @ BMS/DMD; 02-17-2019 at 02:15 PM..
Will we be able to perform logs and save them via this interface ? Yep. Right now I'm still in the very early stages, but I do have successful logging of the data from the JB4 to the mac app (should be fairly straightforward for the iPhone once I get my wireless adapters in). I will be trying these $20 wireless adapters I found on eBay as well when they arrive in a week-ish. So maybe this would be a cost effective option. Hey guys, I've finally started my projects. The wifi option would allow for the use of the charger so I'm leaning more towards that. I figure for the iPhone interface 3 gauges would be about all you could fit on the screen and make it look nice. Do you all have any interest in this? Keep up the great work Dmac! Let me know if you need a beta tester for the Mac app. Will do guys. Anything the JB4 can log I can display. Great! Definitely can't wait for OS X jb4 app. Tired of using my old windows laptop. I would be very interested in this. the OS X version would be very good to have. my PC got stolen and got a mac but cant run logs on my E92!! keep up the great work man. Im sure like me many people on here would be grateful for this. I find that my windows jb4 VM runs nearly as fast as it would on bare metal. Are you running out of memory / swapping? Last edited by Narcosis; 10-13-2013 at 08:57 AM.. Reason: Forgot "nearly"
So you already have the jb4 interface working on mac osx? I have successful serial communication and parsing of the data. Right now I'm working on designing the interface. im in for iPhone app, display gauges and logging !! So awesome!! Can't wait for it to happen!